Here's a sneak peak to our holiday dessert ideas...this one is so adorable. 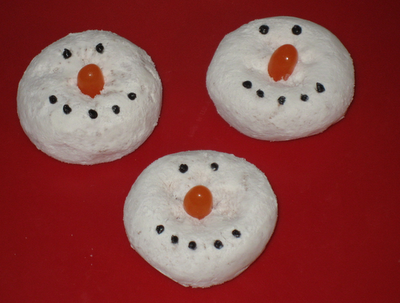 Powdered donuts with orange candy noses (using candy corn or orange jelly beans) and frosting eyes/mouth. This no-bake, easy treat will be great for Christmas cookin'. The weekend after Thanksgiving we'll be showcasing many more creative finds! Make sure to follow us on pinterest, and check back here on the blog for more holiday fun.